The first two Christmas events: The first two events held in Syria were held in the Homs area and both lasted around 4 to 5 hours. There were 211 children at the first event and 100 at the second, but total attendees were around 500 including the parents or guardians. The comments from all the adults were overwhelmingly positive and appreciative. The events included some worship time with a short message shared by the local pastor. Most of the time was consumed by plays and skits presented both by the Sunday school children as well as by the local church members who were in charge of the program. The joy on the children’s faces was unmistakable! Most of the children were either orphans or internally displaced children who had undergone all kinds of trauma throughout the crisis in Syria. All of them were from areas not yet liberated by the Syrian government. It was evident throughout the event that it had been a very long time since the children had enjoyed themselves to this extent. They were enthusiastically indulging in their meals as well! Sanctions against Syria by the United States that were intended to punish the secular government have caused hunger among the most vulnerable of the population including the orphaned children. We learned that it had been quite some time since these children had access to such a nice, warm and healthy meal. That is because obtaining more than cereals and rice in some parts of Syria is very difficult even in areas that were not overrun by Sunni Muslim jihadists. 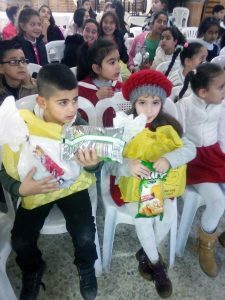 The gifts provided at the end of the program consisted of winter jackets, a set of three Christian books, toys, winter shoes, and bags of sweets or candy. Both the children and their parents or guardians expressed deep gratitude and excitement for the presents. One thing that really stood out from the first event was the very evident joy on the faces of all ages, regardless of the tragedies they had endured. Many of the children had lost some of their family members as well as their homes. Most of the children came from areas in Syria that are still not liberated. Also, something that truly touched the heart of the ministry volunteers was the children with special needs who were seen dancing and laughing and expressing their joy. It was, according to the adults caring for them, the first time they had seen them being so expressive and happy. One of the guardians mentioned as the event ended that she was very surprised the church did not ask for anything in return for all that had been provided. One mother mentioned that they were invited to another children’s Christmas party but that it required an entrance fee. She was overjoyed that at this event children from lower economic circumstances all got the opportunity to participate and receive presents and food. The main message of the events was that Jesus loves us all. All the children who attended the second church wore the new coats that had been given to them prior to the event and had big smiles on their faces. Many of the children did not want to leave at the end of the events that were organized for them. In all 14 Christmas events were held in 8 different locations in Syria for 1,950 children! Please pray that the war in Syria will end, for the sake of the traumatized children of that nation. Please pray that Christians who left Syria can now move back.